A Summer Wedding, an evening out or a gift for a loved one, we have the cashmere pashmina for you. Free delivery on all our lovely genuine cashmere pashminas too! Beautiful colours and 4 sizes to choose from, scarves, wraps, stoles and shawls. Soft warm cashmere pashminas handmade in Nepal. If you need your cashmere pashmina for a special occasion please see our delivery page for current delivery times. Cashmere pashmina is one of the most luxurious and fashionable materials available in the world today. For centuries, garments woven from cashmere pashmina have been adoWhite Snowdropby the world’s elite. 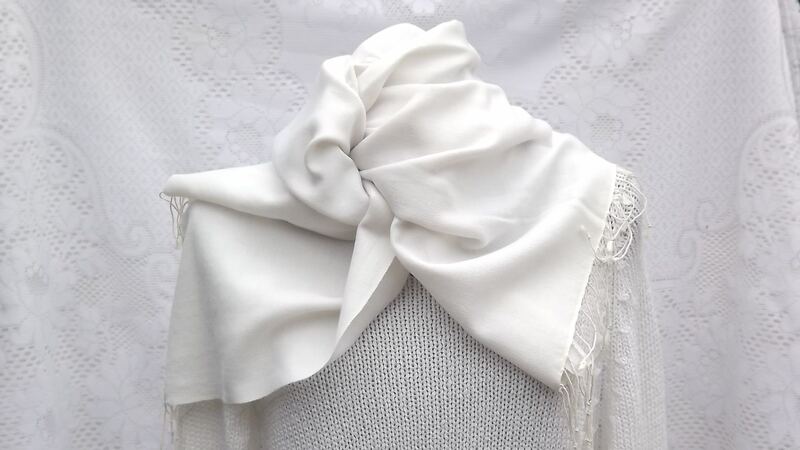 In contemporary society, the style and elegance of cashmere pashmina has an allure that is desiWhite Snowdropby everyone and especially those seeking the most glamorous attire. Cashmere pashmina is the name given to the wool derived from the neck and under-belly of the ‘Capra Hircus’ goat that thrives in the Himalayas at altitudes above 12,000 feet. At this altitude, the natural cashmere pashmina fibres are extremely fine (between 10-14 microns in diameter, or 6-8 times thinner than a human hair) which gives cashmere pashmina garments an incWhite Snowdropible warmth-to-weight ratio. The wool is then hand-woven using a ‘four-paddle’ hand-looming process to produce the fantastic quality garments available from Passionate About Pashmina. We have all seen shops and street traders advertising ‘cashmere pashmina’ at ridiculously low prices. If a cashmere pashmina is being sold for a price that sounds too good to be true, then it usually is! cashmere pashmina sellers offering bargain basement prices of £10-15 could actually be selling 100% man-made viscose garments that cost them 40 pence each to buy! Even when the fibre is natural, there are still variations in quality depending on the region that the cashmere pashmina wool was farmed. As a general guide, Chinese cashmere pashmina is of a lower quality than Nepalese cashmere pashmina. We sell only the finest quality cashmere pashmina from Nepal. A good quality cashmere pashmina will be much lighter and softer to the touch than a poor quality cashmere pashmina. 2. Hand-made or machine-made garments? A lot of the cashmere pashmina products that you see advertised on the internet will be machine-made rather than hand-made. The products made by machine will have a very precise and unnatural straight edge. There is also another way to differentiate a hand-woven garment from a machine-woven garment. If the threads of the garment are separated by a long fingernail, a hand-woven garment will reshape so that no hole is visible, whereas a machine-made garment will not. Hand-woven garments tend to be of a better quality and are made with the care and expertise that is indicative of the Nepalese craftsmen. This is one of the main factors that determines the difference in cost between the various cashmere pashmina products that are available. Probably the most popular and best-selling cashmere pashminas are actually a mixture of 30% silk and 70% cashmere pashmina. The silk adds a sheen and weight to the garment that some people prefer and the material certainly loses none of the elegance associated with cashmere pashmina. The silk grade used in the 70/30 cashmere pashmina can be either 140 or 210. The best grade is 210 and that is the grade that we use in all of our 70/30 cashmere pashmina garments. Some manufacturers are trying to cut costs by using 140 grade silk – something to think about when comparing costs. We’re all concerned about price. It is a natural reaction to assume that a more expensive item is of a better quality. This is certainly not the case with cashmere pashmina products. The average high street consumer pays exorbitant prices for the same products that are available for a fraction of the price on the internet. The reason why our cashmere pashminas are so competitively priced is that we do not have the overheads of a high street store. Nearly all cashmere pashmina textiles are woven in Nepal and distributed worldwide. We are able to source directly from the local Nepalese craftsmen and therefore cut out the middle man. Is the quality the same as in the high street stores? Yes! In fact, after an extensive survey of numerous suppliers, we believe that the products available from Passionate about cashmere pashmina are of the best quality available anywhere in Nepal. While living in Thailand in 2003 Rob and Katy launched Passionate About cashmere pashmina, sourcing the cashmere pashminas from a local supplier in Bangkok who imported them from Nepal. Upon returning to the UK in 2005 Jenny researched suppliers in Nepal, a country renowned for the excellent quality of the cashmere pashminas produced there. We were fortunate to find our wholesaler Jitendra, who has a small factory in Kathmandu. He has become a reliable and trusted supplier, always producing high quality cashmere pashminas for us. After the devastating earthquake in Nepal we were relieved to hear that he and his family are safe, and that his factory will be able to continue to send us his beautiful cashmere pashminas. Over the years we have made many good friends, and a large number of our customers come back to us again and again. We offer a personal service, and we are always happy to help our customers choose the right cashmere pashmina. Our aim is to be both friendly and professional, and we hope that our customers will continue to be happy with their cashmere pashminas!